The statute, enacted 29 December 1838, set out four grounds for divorce: impotence (you couldn’t get a jury trial if that was the ground asserted); adultery; extreme cruelty; and desertion. 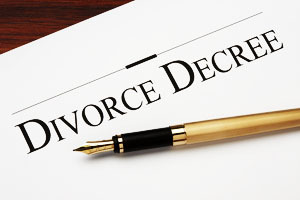 But, the statute made clear, divorce for extreme cruelty or for desertion was divorce a mensa et thoro and to be granted only in the exercise of the court’s discretion. Divorce a what? Couldn’t those guys speak English, for cryin’ out loud? So what was a divorce a mensa et thoro? It’s divorce “from bed and board” — “a limited divorce or separation” by court order.6 Nothing more than a legal separation. He could beat you within an inch of your life, or she could sneak off and never come back leaving you with the kids, and the best the courts could do for you was a legal separation. You were not free to marry again. The common law on marriage and divorce was drawn closely from canon — ecclesiastical or church — law. There were a few things that allowed an ecclesiastical court to declare a marriage totally dissolved, but they had to be found to have existed before the marriage: pre-contract, consanguinity, imbecility, for example.7 Eventually an act of Parliament could totally dissolve a marriage, for adultery.8 That common law rule was generally followed in the colonial United States, though there were exceptions. By the way, divorce a mensa et thoro is still recognized throughout the United States,19 though it’s usually simply called by its plain-English name legal separation. It has advantages — the retention of legally-married status may protect insurance coverage, Social Security rights, joint tax filing, and military benefits, among other things — and for those whose religious beliefs preclude divorce it provides a legal framework to limit the day-to-day consequences of the marriage. But nowhere in the United States today is divorce as limited as it was in 1838 Iowa — and certainly not in today’s Iowa!20 What a distance the law has traveled… in Iowa and elsewhere. My ancestors, being generally poor, managed another type of separation, which I call “divorce by distance.” The husband just up and left, moved two or three counties away, and started another family, usually marrying the other woman (obviously not legal, but no one seems to have objected). The abandoned wife, often left with minor children, moved close to her family and described herself as a “widow” on census and other documents. In at least one case, the wife remarried, and lived less than 200 miles from her first husband and his new family. Since there was never much property or money to quibble over, the legality of all just was never brought up. I suspect I have one of those as well. Either an abandonment or, just as likely, no marriage in the first place. Feel free not to put this comment up on the blog post.